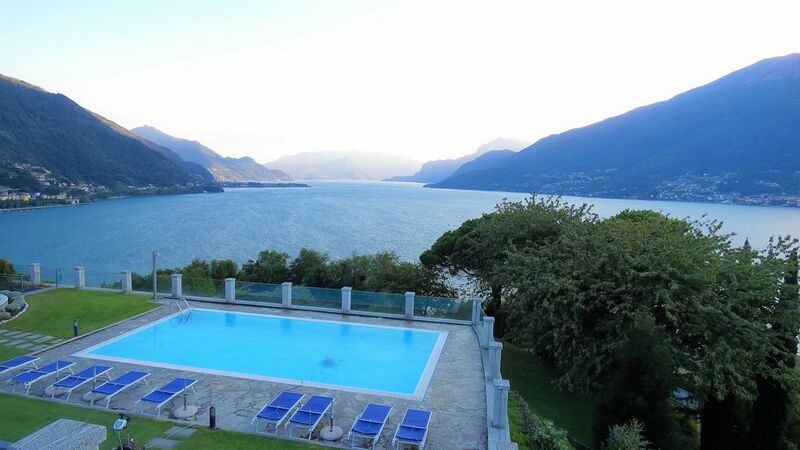 In the fantastic locaità Olgiasca, on Lake Como, lies Villa Michelangelo, a modern gem, rich in style and comfort, able to guarantee the customer a unforgettable dream vacation. One of a kind, the splendid panoramic position allows to reach the mountains, the lake and the center of Colico in minutes. The Villa is completely independent, with an area of ​​over 600 square meters, and is located on two floors, with four bedrooms and three bathrooms, ideal for family and with the possibility of being able to also rent single rooms, all surrounded by a green park full of flowers and plants typical of our lake. The upper floor features a spacious open plan lounge, complete with ultra modern kitchen with the latest appliances. A large sofa ultracomfort, allows you to enjoy the fantastic view of the lake from the panoramic windows, which changes color in the evening thanks to a innovative LED lighting. To complete the living room, a large glass table overlooking the panorama and SmartTV Ultra HD 4K 65 ". The two bedrooms are respectively a double and a triple with single beds, with memory mattresses in aloe vera, for a 5 star rest. bathroom with shower with massaging showerhead and recessed colored LED for a thermal effect. An illuminated marble staircase leads to the lower level, where we find a double bedroom, two bathrooms, a triple bedroom, and a laundry room. In the fourth bedroom there is a double bed and a single bed, with an independent internal bathroom, to guarantee maximum privacy. A wine cellar with wall made illuminated stone, can give life to the romantic dinners by candlelight, accompanied by a bottle of house wine for our kind customers. All 'Outside the villa has a gazebo with exposed wood, from where you can enjoy fantastic panoramic dinners, caressed by the breeze of our lake. In addition, we provide you with a football and a table tennis for your leisure. Free access to the fantastic rooftop swimming pool and its large solarium with sun beds and umbrellas. At your disposal the wi-fi service and the independent guarded parking inside the villa. ultra modern bathrooms with suspended sanitary and closing system slowed slim. Shower in elegance glass with massaging showerheads, and colored LED spotlight for a relaxing worthy of a thermal cure. We had a perfect two weeks in the house, with owners being very helpful. You cant desire more from a vacation house - perfect view, perfect location! Thanks for having us, hope we'll come back some day. We stayed for two nights and had a wonderful time! There were 6 of us and tons of room. Beautiful location and even has a wonderful restaurant within a 50 meter walk. Highly recommendable! Precisely as described, great view comfortabli e modern setup. We enjoyed the week we spend with our family in Olgiasca... the house is modern , clean, offer spaces in and out , well eqipped for self catering. We were two families staying at Villa Michelangelo for a week and we all enjoyed it a lot! There was enough space for everybody in the villa, comfortable beds, a well equipped kitchen, some games outside for the kids, a big pool area and a breathtaking view. Michele was very helpful and nice host. The only thing missing was air conditioning, but everything else was more than fine. We totally recommend this place for families with kids. Thank you! We had a great two great nights at this house. The kitchen and living room is a great size for a large group. We enjoyed cooking together in the kitchen and the view from the large windows made it that much more enjoyable. The table football was a great entertainment for everyone. Thank you! 7 of us stayed here in September 2017 in Week 2 of an Italy and Adriatic vacation, after a week of cruising. A great way to 'recover' from the food and busyness of a cruise, is to settle into a villa on a mountain lake and live like a local as much as possible. Villa Michelangelo is a great place to do just that. The Location of this Villa, up the east side of Lake Como is easy to get to up SS36 and relatively quick from Lecco, with the highway. The Location of this Villa, up the east side of Lake Como is easy to get to and relatively quick from Lecco, taking SS36. On the northeast side of the lake gives options to go down the lake, around the top to the west side, or north into Switzerland. The Layout of the villa provides two private bedrooms downstairs and two accessible bedrooms upstairs. All have views out the back of the villa, towards the lake. The kitchen/living area has more than enough space for 7 or 10 people. Nice private yard and easy access to the pool. The Lake Views and the mountain views are breathtaking. This peninsula puts you nearly in the middle of Lake Como, with amazing views to the south, with Bellagio in the distance. The walk down the hill to the Abbey, gives great views to the north. Michele had excellent communication through all stages of the reservation and stay. Highly recommended for a large group of travelers. Lake Como has an extensive network of paths and steps, able to meet the needs of all the visitors and hikers, who want to take a walk in nature. Horse riding in the Pian di Spagna Natural Oasis and its surrounding areas, there Faran live unforgettable moments in close contact with the pristine and wild nature reserve. The countries bordering the lake have enhanced in recent years, the areas along the shore, creating tourist attractions, services and long walks for walking and cycling, where you can admire the beauty of the landscape that presents itself. La tariffa si intende a piena capienza della Villa di 10 persone, Diamo la possibilità di affittare anche singole camere, senza dover soddisfare la piena capienza della residenza, ovviamente con adeguementi di prezzo ragionevoli, scriveteci per un preventivo personalizzato sepcificando il numero di persone che intendono soggiornare. Aspettiamo il vostro contatto e in base alle vostre esigenze e al numero di persone raggiungeremo senza dubbio un accordo totale!